Whole fish might seem daunting, but it's cheap, healthier and very hard to overcook. 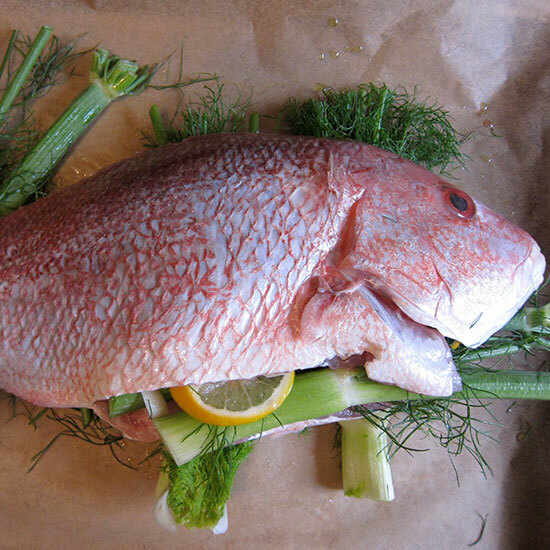 Here, a brilliantly easy and healthy recipe for snapper or striped bass. Since I conquered my fear of whole fish, I rarely go back to cooking fillets. Sure, there are more bones (And a head! With eyes! That stare at you!) to deal with, but I love that whole fish is cheaper and harder to overcook. Since this fish is the perfect size for two, I like to serve it on a platter in the center of the table, allowing each person to pick at it. You can also pull the flesh off the bones before you serve it; this video from Melissa Clark has some great instructions for how to do so. Any bright, crisp white is great with this dish. I opted for a northern Italian white—it has a saltiness that’s delicious with all of the briny things in the salad. 1. Preheat the oven to 425°. Line a baking sheet with parchment paper. Remove the stalks from the fennel bulb and arrange 3 of them on the baking sheet. Brush both sides and the cavity of the fish with 1 tablespoon of the olive oil and season generously with salt. Set the fish on top of the fennel stalks. Stuff the cavity of the fish with 2 more fennel stalks and the thinly sliced lemon. Roast the fish for about 30 minutes, until the flesh is white throughout. 2. Meanwhile, quarter the fennel bulb lengthwise and remove the core; slice the bulb crosswise 1/4 inch thick. In a bowl, toss the sliced fennel with the cornichons, pickled onions, capers, the remaining 1 tablespoon of olive oil and the juice from the remaining lemon half. 3. Transfer the fish to a platter and serve with the salad. Wine A clean, salty northern Italian white, like 2012 Olim Bauda Gavi di Gavi. One serving 399 cal, 18 gm fat, 1.8 gm sat fat, 8 gm carb, 3 gm fiber, 54 gm protein.